“Las Casas saw soldiers stabbing Indians for sport, dashing babies’ heads on rocks. And when the Indians resisted, the Spaniards hunted them down, equipped for killing with horses, armor plate, lances, pikes, rifles, crossbows, and vicious dogs. Indians who took things belonging to the Spaniards—they were not accustomed to the concept of private ownership and gave freely of their own possessions—were beheaded, or burned at the stake. Las Casas’ testimony was corroborated by other eyewitnesses. A group of Dominican friars, addressing the Spanish monarchy in 1519, hoping for the Spanish government to intercede, told about unspeakable atrocities, children thrown to dogs to be devoured, new-born babies born to women prisoners flung into the jungle to die. Forced labor in the mines and on the land led to much sickness and death. Many children died because their mothers, overworked and starved, had no milk for them. Las Casas, in Cuba, estimated that 7000 children died in three months. The greatest toll was taken by sickness, because the Europeans brought with them diseases against which the natives had no immunity: typhoid, typhus diphtheria, smallpox. Perhaps it’s about time to do away with Columbus Day. I know, I know, we love violence in this country and we sure as hell don’t want to give up a day off work or school. But perhaps we can replace this holiday with another. 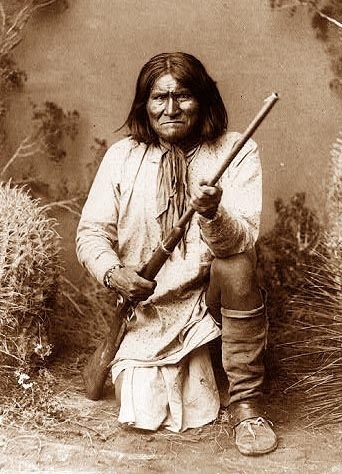 Goyaale, better known as Geronimo, was a violent man as well – but unlike Chris Columbus, his violence was justified. After his mother, his wife and his three children were killed in an attack by Mexican soldiers in 1858, Geronimo went on the war path. For 28 years he and his Apaches fought the Mexicans as well as the Americans, who were systematically carrying out a genocide and relocation operation against the native peoples. Maybe we can begin celebrating “Geronimo Day” in America and pay tribute to his fighting spirit and the will to stand up to injustice. Or not. 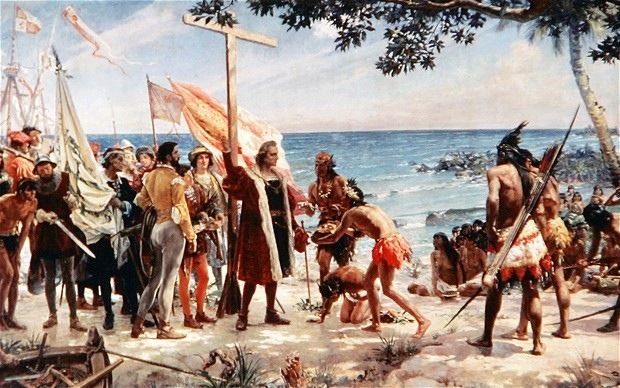 We fear change in this country as much as we fear words like “socialism” or “regulation” or “diet.” At the very least, on October 14th, we should educate our children about who Christopher Columbus really was – a egomaniacal psychopath who spread death and destruction in the name of Christianity – and stop celebrating the life of a homicidal maniac as if he were some kind of noble hero. Author: Nick Allison is just a banged-up combat infantry veteran of the War in Iraq. He lives in Austin, TX with his wife, their children and two big, dumb, ugly mongrel dogs. Don’t take anything he says too seriously… he’s just trying to figure out this ride we call existence like everyone else. Also, he enjoys writing his own bio in third-person because it probably makes him feel more important. Buy a T-shirt or make a donation to AIM, the American Indian Movement, in honor of Columbus Day. But will be happy to support Geronimo day to! As a full blooded Lakota I will say thank you for writing this. Colombus was a terrorist and murderer and deserves very little attention. TY.